More Considerate, & More Joyful! All parents want to raise “good kids”. They want their kids to be thankful, polite, joyful, and well behaved. They want their kids to grow up into adults with good character and a strong moral compass. Today’s kids are asked to learn a LOT- science, history, math, English, computers. But it’s very rare for kids to actually be taught virtues. It’s a soft subject that can’t be included in standardized tests, and often gets ignored or left to learn about at home. However, it’s virtues that often determine a child’s future. Failure to develop Biblical virtues can lead to selfish behavior, poor choices and lots of unhappiness. On the other hand, kids who base their lives on virtuous behavior have been shown to have greater peace of mind, greater self-confidence and self-esteem and more joy. Here’s your chance to teach your students 12 important Biblical virtues that will help them build the character and integrity they need to achieve true success and build strong relationships. In this lesson pack, children will see how their peers handle difficult situations that they could also easily face in the future. 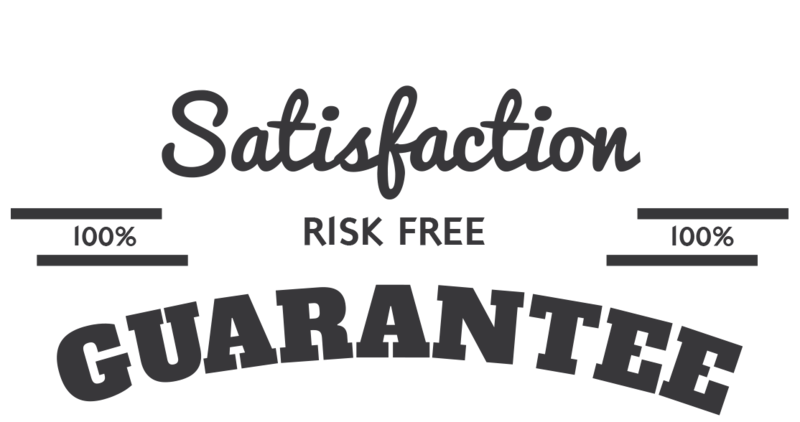 Kids will discover the importance of making wise decisions and why having good character and “never crossing that line” can be the difference between living a happy, satisfying life and a life that has more than its share of sadness and disappointment. A present-day story about a child in a situation any kid can relate to. A series of Bible lookups and discussion questions to help them understand how the virtue is acquired. An in-class activity to reinforce what’s needed to acquire and maintain that virtue. An art & writing project, which you can use as part of the day’s activities or send home as a mid-week recharge that involves the parents. You can teach one virtue a month and cover all 12 in a year. You can teach them over a six-week timeframe, covering two virtues per class and sending home the art and writing project materials each time. You can teach them over a 12-week timeframe, making the art and writing projects part of the in-class work. Order Now & Receive the Following 2 Bonus Gifts! We’ve designed a companion set of 12 prayer cards for kids. Each prayer card focuses on one of the 12 virtues contained in the lesson pack. Each card contains a two-line prayer focusing on the selected virtue. This small prayer can stand alone for younger children, or serve as a springboard for older children. We also include a related Scripture verse and a famous quote. This is the perfect little flip book to have on a child's bedside table to pull out each evening! Each prayer card reinforces a Biblical virtue all Christian parents hope to instill in their kids. 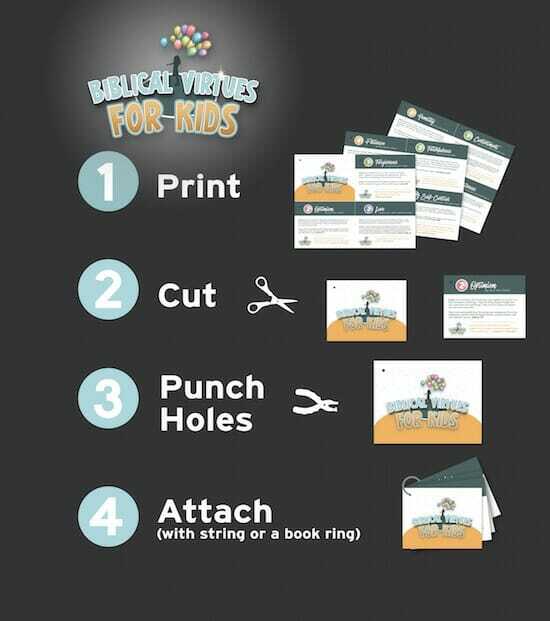 Assembly is easy- just print, cut, punch holes, and attach the cards together with a string or book ring. It’s a fabulous craft the kids can make and use! Print out as many copies as you need! 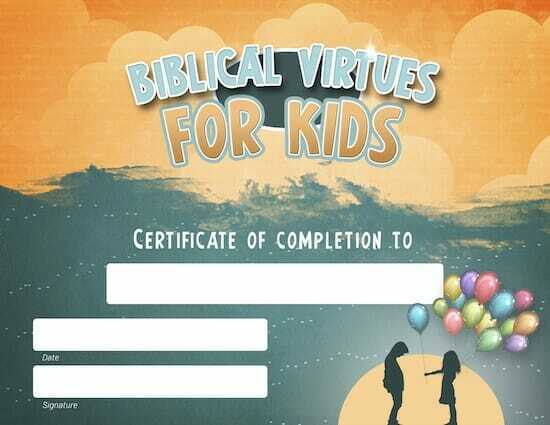 Use our printable 8.5 X 11 certificate to award students upon completion of the Biblical Virtues Lessons. Print Out As Many Certificates & Prayer Cards as You Need! 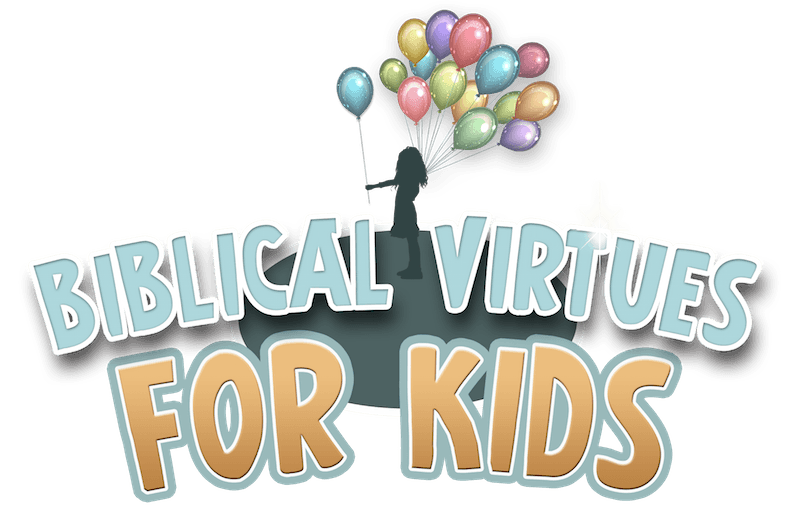 That’s right, we are so sure that you will love the Biblical Virtues for Kids Lesson Pack that we are offering an unconditional 100% money-back guarantee. Remember, We Are All Called to Live Virtuous Lives! As these verses make clear, it’s important to God for us to live with virtue. 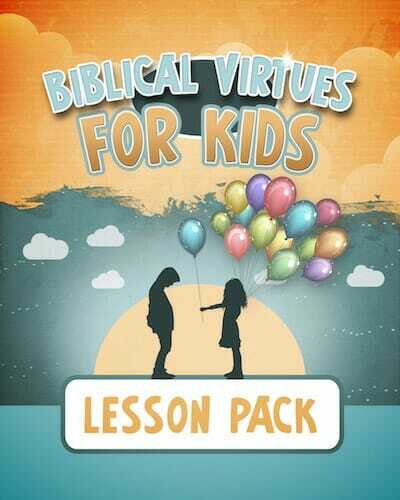 This lesson pack is designed to help kids develop the solid foundation of virtues they need to grow strong in character and integrity. At a time when biblical virtues are being ignored by many in society, it’s more important than ever that kids learn about their importance and how they can be applied in difficult life situations. Don’t let your kids go through life without a ‘moral compass,’ help them develop virtues they can rely on to safely navigate through the most challenging circumstances. YES, I want in! I want access to the "Biblical Virtues for Kids Lesson Pack". Please give me INSTANT access right now!